The Eurocode 7 Norm does not include a specific section for the landfill design and therefore the case of the landfill has to be “assimilated” to section 11 and 12 “Overall stability and Embankments”. This European Norm (EN 1997-1) takes into account 3 steps for the determination of the parameters to use in the slope stability analysis. The ULS has to be verified (using Design values) if there is an expectancy that the peak design loads applied to an object could cause serious harm or the collapse of that object/surrounding infrastructure. The Norm proposes different design approaches based on the combination of partial factors of safety (see figure above). Each European Country choses its DA (Design Approach). Belgium has chosen DA1. The DA1 is further grouped in Combination 1 and 2 (C1 and C2). 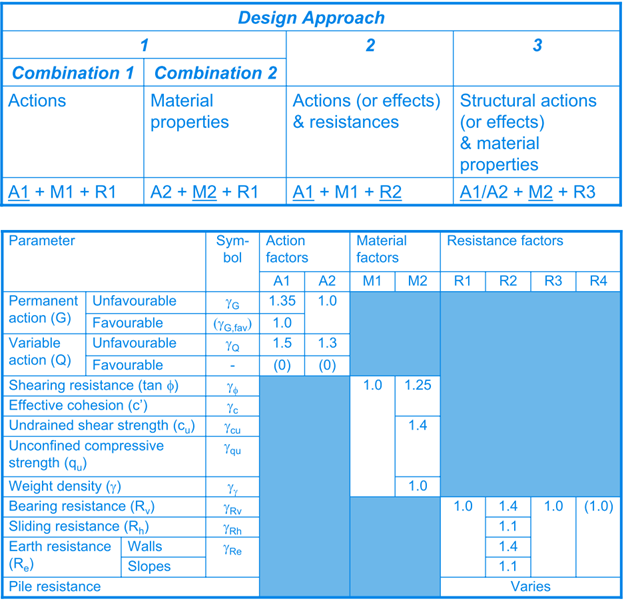 Basically in C1 the partial factors of safety are assigned to the properties of the material. In C2 the partial factors of safety are assigned to the actions. The designer has to choose which combination to use.